KINGSFORD — Dominating the Kingsford Invitational girls track meet for the third straight year has brightened the Flivvers’ hopes in the MHSAA Division 1 regional. The Flivvers are part of Thursday’s UP Finals qualifier in Negaunee. 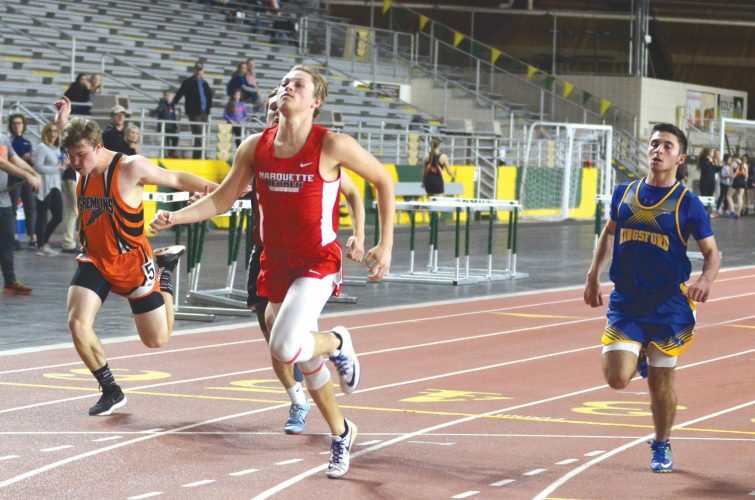 They ran away with their seven-school track meet Thursday, registering 138 points to 95 for runner-up North Dickinson and 89 for third-place Iron Mountain. The Flivvers accounted for 11 personal records in winning eight events. “That was huge in terms of points and allowing us to get the win,” Harry said. Flivvers’ Olivia Allen, meet record-holder in the 200 and 400-meter dashes, won those events along with the 100-meter dash. She ran a 59.68 in the 400 — just .04 away from her meet-record time. Three Flivver relays took first. Rylee Palmer captured pole vault and Peyton Johnson added the 800 (2:34.53) with a personal best time. “Those were big points,” Harry said. Renee Roberts had personal records in the long jump (14-9, second), 300 hurdles (52.57, second) and shot (31-4, fourth). The senior also ran on the winning 800 relay (1:52.69) with Sarah Roell, Emma Allen and Kendra Nora. Flivvers’ Lily Menghini had a personal best in the 1600 (6:02.18, second). Melanie Wenzel contributed in the winning 3200 and 1600 relays, and placing third in the 800. For the Mountaineers, Taylor Talerico had personal bests in the high jump (4-11) and 300 hurdles (50.22). Olivia Berutti was first in 110 hurdles and second in 200. Talerico and Berutti joined Courtney Partello and Tiana Brooks in taking the 400 relay (53.87). Iron Mountain freshman Sarah Kulas was running third in the 3200 (13:32.46) before making her move late in the seventh lap. 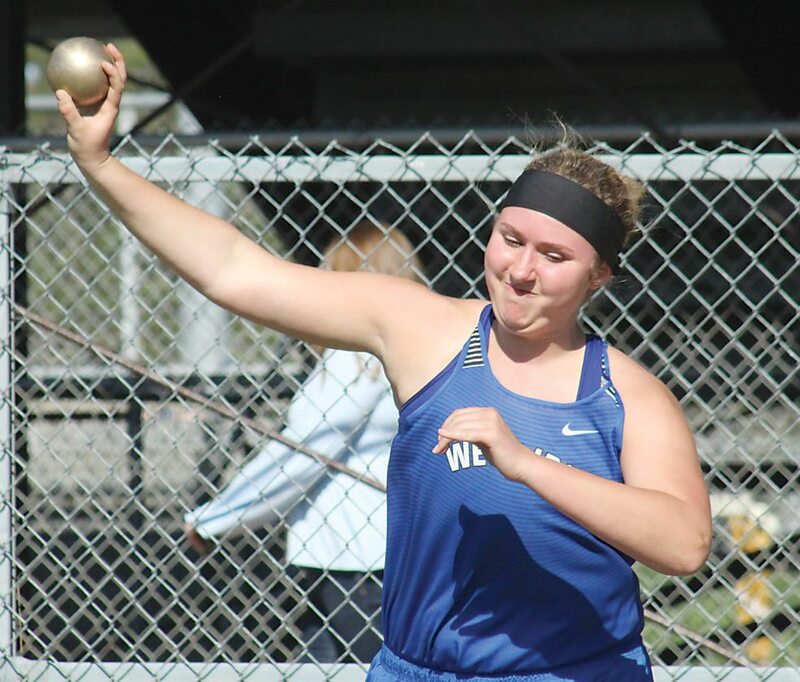 West Iron County’s Rachael Tefft broke the meet’s shot put record, posting a toss of 37-feet-5 to erase the record set by the Wykons’ Hannah Holma in 2011 (37-2.25). Tefft is an inch away from the WIC school record. Sophomore Brianna Smith led North Dickinson, taking first in the 1600 (5:54.87) along with seconds in the 800 and 3200. Khalajia Hannah of the Florence-Niagara co-op won the long jump (14-10.75).